Again this summer, my wife and I took a holiday in Northern Ireland. The weather was wonderful and the countryside verdant and green. The sites we visited were not all different from last year since we drove friends to places they had not been even though we had been. 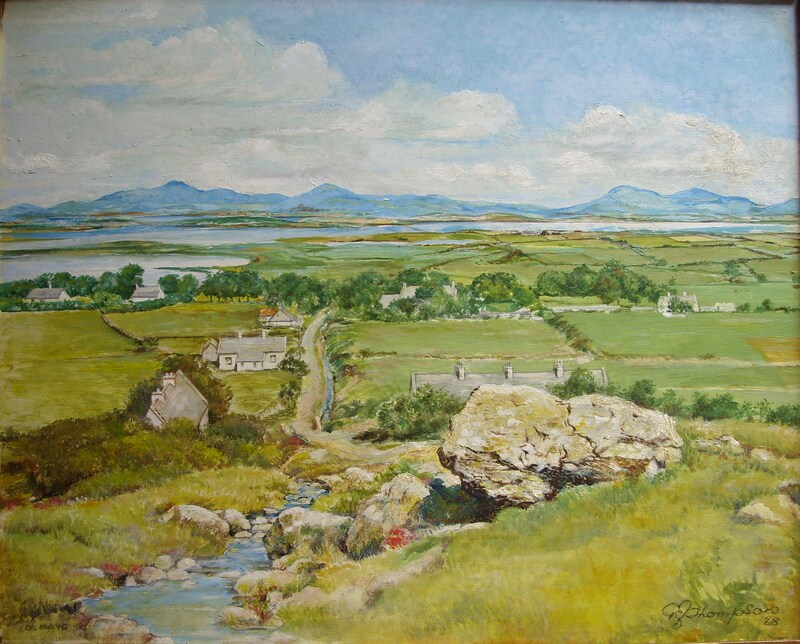 As with last year, I post an oil painting from County Mayo in Ireland. This painting embodies all that one considers Ireland to be. A green and fertile land, a land of mountains and lakes, of ancient farms and homesteads, a place of grazing sheep and cud chewing dairy cows. In the distance, is this the mighty Twelve Bens mountains sweeping down to Galway Bay as seen from #Rosmuc? #Connemara is a place of ever changing landscape – of majestic mountains, spectacular beaches, the wild Atlantic, mist covered lakes, pre-historic bogs, and shady glens. One can imagine climbing this hill and turning to survey the land. What a sight lies before you. I love the colours in this painting and my favourite bit is the large boulder just in the front. It is finely painted with a life and dimensionality one wishes to reach out and touch it. This oil is not likely of Ireland but it continues the landscape motif this week. Sites like that pictured can be found in Wales, Scotland , or England. in the remote places. One can find back roads and lanes which lead to secluded bits of paradise. Here the wildlife has not experienced man so fear is not in them. 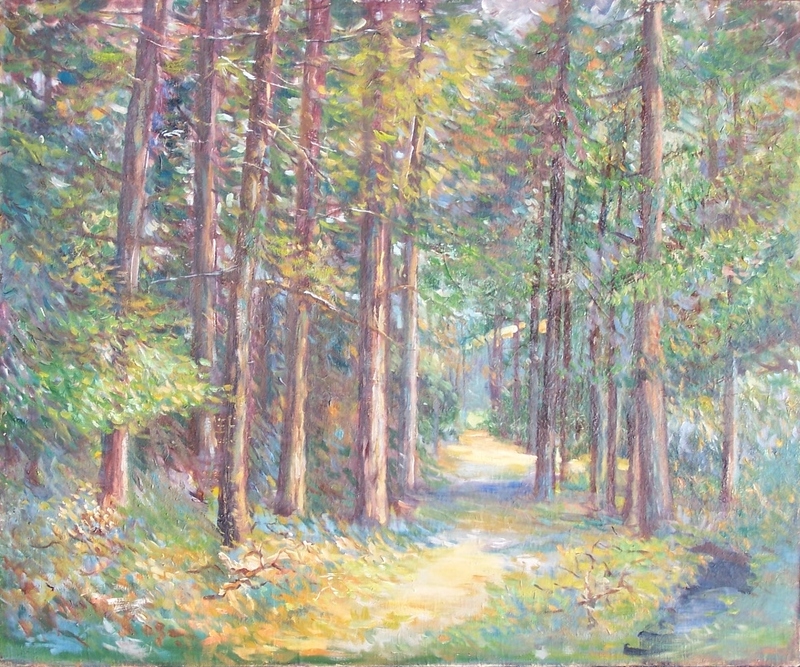 H. D. Hatch captures the idyllic calm and peace of these places in his painting of 1901. The site is unspecified but the place is one which we can find down the country lanes and paths. Do you not feel the desire, the urge to go there and experience this little bit of peace. Why do these wild places attract us? What do they hold which we desire? What is the reason that these lonely and remote places are so healing to us? Just walk down this forest path and feel the healing enter into you. Be healed by touching the earth, walking barefoot upon the grass, caressing the rough bark of the trees, breathing the scents of the forest, hearing the wind whisper, seeing the colour of life, and tasting the health of this place. 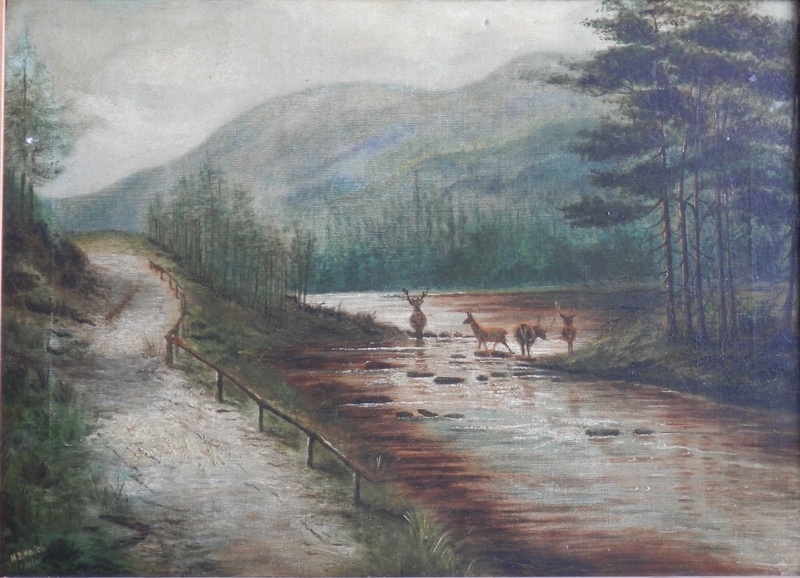 This entry was posted in Oil Paintings and tagged Connemara, deer, field, forest, green, Ireland, Kinver, lane, pine trees, road, Rosmuc. Bookmark the permalink.